Thank you for coming to the FAQ. We promise to keep it relevant and current. If your question hasn't been asked before or answered satisfactorily, please feel free to write to TimeHavenMedia @ Gmail.com. Be sure to see the Help page. All the gestures and controls are described there. The Help also explains the features in the current version. You can also refer to the same Help within PolygonFlux itself. FYI - We are developing this Math Minded page that will explore various mathematical aspects of PolygonFlux. Q 1: I changed the emitter angle just one degree and the whole thing changed. Is that a bug!? A: It's not a bug. As you change the angle, the angles of all subsequent bounces change too. It's easiest to see in the Square — the lines stay parallel. The one degree of change doesn't accumulate each bounce — instead, the initial shot hits a side, bounces, hits some other side, and each reflection point moves a little bit along the perimeter. Eventually, the point hits a different side than the side it hit with the previous angle. That bounce affects all subsequent bounces, which could be half or more of the pattern, so the pattern "flips". The computation is iterative, with each result depending on the previous. The trajectory you see is produced by it. The square and even-numbered polygons seem relatively well-behaved compared to the odd-sided polygons 5, 7, 9, ... which can really "mix it up", where the lines sometimes seem to be scattered every which way. This is the first observation of many you can make about the flux pattern. Patterns are also formed by the overlapping lines of the flux — both by the darkened intersection of lines, and by the voids of empty space. These visual patterns seem to move as the angle is adjusted. These are called Moiré patterns. Q 2: Hey, this thing gets laggy. Can't you speed it up? A: This is a good topic for discussion. Some themes require more computing than others, and are therefore slower. Some are fast at 1000's of bounces, others are slow at 100! Themes with shadows are significantly slower, and so should be avoided when just sweeping around with the emitter looking for interesting patterns. Use Neutrino or Electron to explore, then choose other themes to see what they look like. Another remedy is to reduce the number of bounces if your device is lagging. When you get something you like, patiently increase bouncing to see the effect. See How to Use PolygonFlux Effectively on our Help page. You will find that a shadowed pattern with wider lines is often more pleasing with fewer bounces anyway. If you really want 100's of shadowed lines, be prepared to wait a second for the fluxagon to appear. Suggestion - Play with 25 lines when using Prism #2 or #3.. increase bouncing conservatively on themes with shadows. We want people to be able to see patterns that are a bit beyond instant rendition. You will need patience for those. We'll do our best to optimize the bounce calculation in future releases, but there will always be a difference in speeds between themes, and when increasing the number of bounces. A Note on Perception: In reality ( == geometry), there is always variation in the pattern as the angle changes. Fantastic fluxagons appear after 4000 bounces in an 11-sided polygon. A change of one second in the angle is enough to completely change the pattern! So, we shouldn't expect to see any continuity of the flux — it will appear "choppy" at any frame rate, kind of like a fractal. The pattern often jumps like a kaliedescope as the pieces of glass tumble inside. Q 3: Why does the pattern change more when dragging the emitter one way than another? A: The emitter is emitting in one direction at any time, right? So, if you move the emitter precisely forward in that direction, or backwards, you haven't changed anything (geometrically) other than moving the emitter closer to or further away from the side it will eventually hit along that path. If you move the emitter sideways from the the direction it is emitting, then you are shifting all the lines over in the pattern. The best place to observe this is in the Square — where you clearly see waves of straight lines shifting back and forth as the emitter is dragged. You should then also see lines "shifting" in the triangle and other polygons. (But keep in mind the answer to Q 1). Q 4: How can I print? A: At this time, you have to save a flux to the Photos album, then pick it up in the PhotoStream, and print from iPhoto. Or, you could to E-mail it to your self, save it out of email and print from Windows, Mac, or Linux. Q 5: What is the Educational Value of PolygonFlux? We think that PolygonFlux can stimulate thinking about the structure of the natural world and how geometry and art interact. PolygonFlux is an abstraction of very real phenomenon — light reflection, the path of rays through crystal structures, and so on. How could it not have educational value if it is geometrically correct? Please contact us if there is anything we can add that will make PolygonFlux more valuable in the classroom. Check the Math Minded page for various challenges and questions (a Work in Progress...). Q 6: Is the "initial angle" the angle of the starting vector? A: Yes! It's the angle at the origination point whence the particle heads off. We could also call it the Initial Orientation. You can think of the orientation changing every time the point bounces, but the initial angle is where it all begins. Q 7: What is the "Origination Point"? A: The Origination Point is the point inside the polygon where the first line originates, like a beam of light. The first line is shown as dotted or shown in a different color than other lines in that theme. It is not drawn at all when the fluxagon is saved in Photos or prepared for Mail, nor is the red emitter symbol or Termination Point (black circle). BTW, it's interesting to follow the movement of the Termination Point along the polygon perimeter as the angle turns. Q 8: What is an "Orbit"? A: An orbit is when the point makes a complete circuit bouncing around and starts retracing the same exact path. Using the geometric facts of the triangle, you'll see that the point will hit the third side at a right angle and bounce back the way it came in. See the Math Minded page for more about orbits. "Near" orbits result in bands or rings of parallel lines caroming off the walls like dozens of Parkour or tracer runners. Q 9: Where did you get this idea? A: Please see the History page for that story. Q 10: Why is PolygonFlux limited to 14 sides? A: The number of sides affects the speed of the computation somewhat, so we didn't allow 50 or 100 sides, for example. Besides, many-sided polygons start to behave more like circles with flat spots in them. Speaking of circles, they are way more predictable than polygons, but can produce an interesting range of fluxagons — polygons, stars with any odd number of points, etc. We may add circles and ovals to a future release. 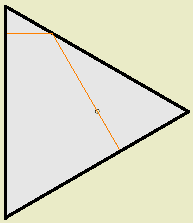 We also plan to add non-regular polygons such as scalene, right, and isosceles triangles. Q 11: Can I send a "Live" Flux to another person with PolygonFlux? Till then, you can just tell your friends the number of sides, number of bounces, and the angle measured in degrees minutes and seconds... and let them navigate to your fluxagon. Q 12: What the difference between a Fluxagon and "Flux"? We've invented the terms to distinguish between the active and static state of a form generated by PolygonFlux. Flux refers to the active form you see in the Flux mode of the App — the form that changes in response to gestures. A Fluxagon is the static form that you save in Photos, send in Mail, or place into the album. Fluxagons in the Album can be "Energized" back into the Flux. Q 13: Will there be an Android version of PolygonFlux™? A: We will work on Mac OS X and Android versions as soon as possible. We feel that we have the sole right to port 'PolygonFlux' to an Android tablet. See "A Challenge for Other Developers" at the bottom of our Help. Q 14: Will there be a Windows version? A: At this time, we have no plans to release PolygonFlux on any Windows device. Q 15: Do you have any other ideas for Cool Apps? Q 16: Where can I send a question or comment? Please feel free to write to TimeHavenMedia @ Gmail.com. We can't promise an instant reply, but rest assured, we read every message. Thanks again for reading the FAQ, and thinking about these interesting concepts.